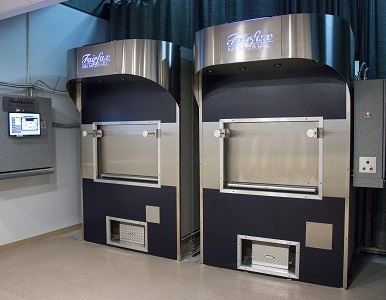 We own and operate two crematory retorts, both located in our funeral home. This means that your loved one never leaves our building to be given over to the care of an outside cremation organization. Cremations may be witnessed. Adjacent to the retorts is a peaceful, comfortable gathering room, with large glass French doors that may be opened or closed while viewing the cremation. Whereas many funeral homes will either not allow private cremation viewings or they might add an additional fee, we offer this as a courtesy for you if you wish to be present. Please feel free contact us at 703-425-9702 if you have any questions or would like to schedule a tour of our crematory. We have been highly trained in the practice of cremation by various skilled government and private organizations, and we are certified as cremation experts by the international organization: Cremation Association of North America (CANA). You can be assured that your loved one will receive capable and attentive care. We respect and adhere to all laws regarding the handing of cremations. We even go beyond all governing laws with additional practices to ensure the highest level of care and respect. Personal Items: All personal items with the deceased, such as items in pockets or jewelry, are removed upon arrival at the funeral home. They are placed in a secure location and clearly labeled and given to the family by the funeral director. Pre-Cremation Procedures: Any foreign material, such as pacemakers and prosthetics, are removed prior to cremations, and properly disposed of or recycled in accordance with all applicable governing laws and practices. Cremation Process: Only a licensed funeral director or licensed funeral apprentice or funeral assistant certified by the State of Virginia may perform a cremation. Whether the cremation ceremony is to be open to family and friends is at the discretion of the person who makes the arrangements. Release of Cremated Remains: The cremated remains of the deceased are kept under lock and key at all times. Cremated remains are only given to the signer of the contract, or the designee, with identification. Records: Detailed records of all cremations are kept on file indefinitely.